One of the reasons that Pretty Lady is so very fond of her Gentleman Friend is that he combines, within his character, equal elements of both Fun and Pragmatism. He is neither an Idle Dreamer nor a Humorless Workaholic, but rather a 'Let's Do It!' sort of fellow. Thus, when he states, 'It would be easy to install a track light in your studio,' he goes to the electrical supply shop that afternoon, and has Pretty Lady's studio gorgeously illuminated by sundown. Instead of saying, a year later, like so many others, 'It would be easy to install a track light in your studio...'. 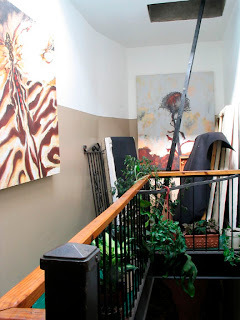 So it is that Pretty Lady and her G.F. are already well on the way to transforming their formerly dismal and cluttered Stairwell Storage Area into an Indoor Art Garden, complete with waterfall. Most of the plants that Pretty Lady potted yesterday are of the 'medium, filtered light' to 'low light' variety; it remains to be seen whether the skylight is sufficient, or whether artificial supplementation will be required. Having a G.F. to whom electrical wiring is No Big Deal gives Pretty Lady such a cozy, secure feeling! 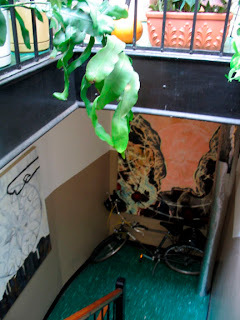 How lovely it is, also, to have downstairs neighbors who do not object to having their foyer overtaken by art and bicycles. In fact, the Japanese lady spent all day Sunday helping Pretty Lady clean the hallway, and enthusiastically agreed to store several paintings on her walls. The column in the right hand corner is on generous loan from the wondrous artist Danonymous, a.k.a. Daniel Scheffer; if Pretty Lady gets her way, someday it will have a light source inside of it. But the Crowning Glory is to be the Actual Running Fountain, installed in the area where Pretty Lady's portfolio is awaiting transport to air-controlled storage; the G.F. ordered the pump last night. Then, a trip upstate to collect rocks...fun with concrete...and then--dare we say it--orchids? Uh.....pretty lady.....I don't quite know the right way to say this. BUt concerning the column, it actually isn't a loan. The column was a present to you. A light inside would be a marvelous idea. Ah, a man after my own heart. Thumbs up GF! I wondered if there were any such as yourself in NYC. It's hard to judge for certain, but the cast of the light from the skylight across the left wall, together with the size and proximity of it, leads me to believe it is quite sufficient for the plant's light requirements. Really, Danny? I can KEEP it? Forever? Wow! Thank you! DC, I hope you are right. I worry about those Brooklyn winters, and snowy gray days. But then, tropical plants are shaded by those huge tropical trees. At night, candles! And strings of Christmas lights wrapped round the banisters! And an antique chandelier, or at least one of those Turkish silk hanging lamps! PL...if you keep it forever, you will live forever. I never thought of it as a loan. It was yours from the start. Oh how utterly lovely, in every single way possible. As the Biosphere II denizens learned, though, glass isn't clear on all electromagnetic wavelengths, some of which are necessary for optimal plant growth. Glass is mostly opaque to ultraviolet, for example. I have a philodendron (named Phil, of course) which barely grows at all (and was almost killed when my kids pulled off its dangling branches when they were little). A friend of mine had a philodendron in a tank with frogs and so had a full-spectrum light on it, and the damned thing grew like blazes, easily putting out in one month what poor Phil took two years to do. So you might want to add a grow-light, is what I'm saying. These days, though, that might net you a raid by federales looking for marijuana. Chris, my cubicle at work is under a skylight and I have been successfully growing a jungle for going on eight years now there. The most important spectra for plant growth are centered around the red end, around 660-690 nm, and around the far blue end from 440-470 nm, both of which do pass through glass ok. Both near ultraviolet and near infrared can help the growth of certain plants, but your typical gro-light isn't going to do much in those ranges anyway. If you're serious about growing under lights and don't want to waste unnecessary energy on useless parts of the spectrum, LED grow lights would be the way to go. Oh, I wish I could invite you guys over to help rearange our place! We've almost got the office/guest room/pantry semi-functional now, but there are still all the other rooms to be done. Did you know that spider plants (also called airplane plants) grow nicely without any natural light, just flourescents? Spider plants do love real light, though. We have a spider plant that languished in the dark in my son's room for years, but when we moved it into the kitchen it just about exploded. I've transplanted cuttings from it into my toad tank. The toads seem to like it. A downstairs neighbor volunteered to help cleanup your mess in the hall! This is lovely. And seeing your shots of the two floors from the stairs gives a sense of approaching your apartment, rising from one beautiful place into a delightful garden world. What a wonderful feeling to welcome you home. The paintings look great. 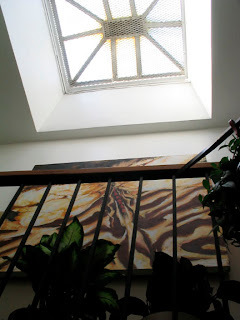 My favorite is under the skylight. But I also like the way that the floor color helps the main color of the one by your bike pop in its lower light spot. The spiral of energy out of it gets to grab you from both directions! I look forward to the next picture. My best to you and your GF.